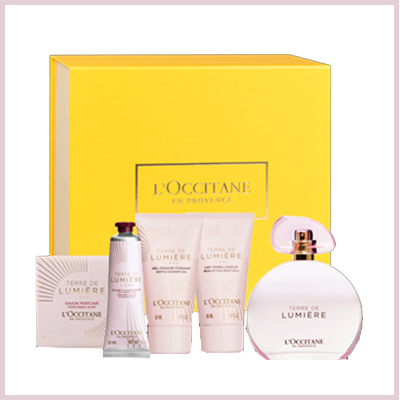 Last year, L'Occitane released the now iconic Terre de Lumière, and now its pretty pink sister has arrived. The new Terre de Lumière L’Eau bottle blossoms with powder pink hues to reflect the dawn light of Provence. Enclosed within is a delicate fragrance that breathes serenity; Terre de Lumière L’Eau. Terre de Lumière L’Eau is fresh and delicate like a dewdrop glistening in the dawn light. Before the flower blooms at the heart of the fragrance, bergamot and pink pepper notes bring the fresh air of dawn. Then, as the sun warms the earth, floral notes revel in white musk and tonka bean scents, revealing the most voluptuous accords. And now, just in time for Mother's Day, here's your chance to win an absolutely divine Terre de Lumière L’Eau Luxury Collection worth over €100. To be in with a chance to win, just fill out the form below.